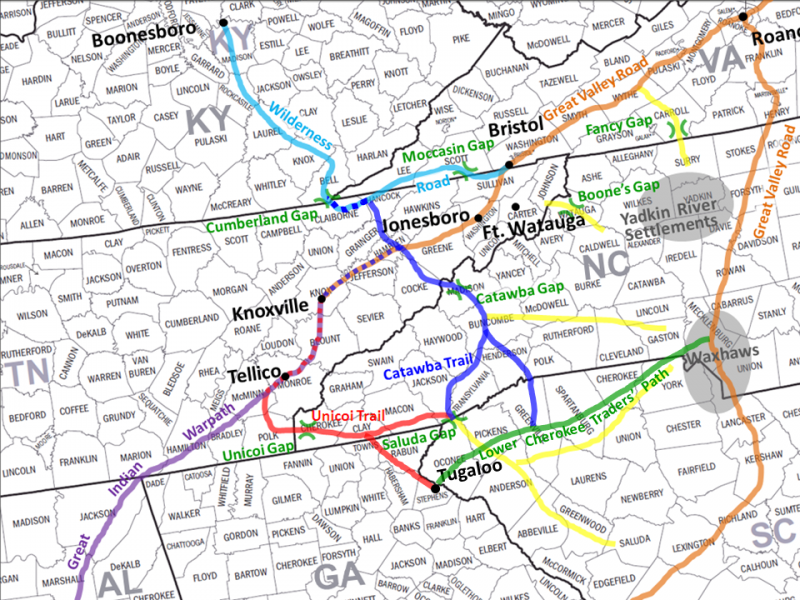 Catawba and Unicoi Road map from Saluda Gap to Knoxville together with the Great Indian Warpath, and Great Valley Road, the main pathways into East Tennessee. Shows Great Indian Warpath in to and out of North Alabama. Source: Self. Based on description in Doug Drake, Jack Masters, and Bill Puryear, Founding of the Cumberland, The First Atlas 1779-1804, Showing Who Came, How They Came, and Where They Put Down Roots (Gallatin, Tenn.: Warioto Press, ©2009) [FHL 976.8 E7d], 20-23. Permission: Public domain. I, DiltsGD, the copyright holder of this work, hereby release it into the public domain.